Green olives with olive oil are marinated for 8 weeks in extra virgin olive oil. This recipe allows a refined exchange between olive oil and olives, to offer the result of an almost-candied olive. As an aperitif, the olive will be much-loved and its oil can be enjoyed with bread. 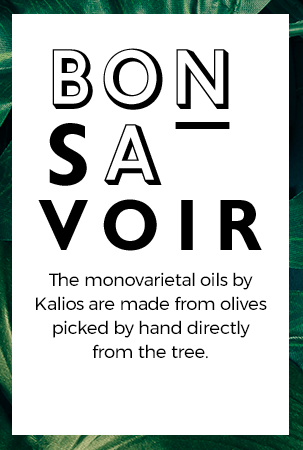 Original and refined, its authentic taste is enhanced by a light drizzle of Kalios olive oil. In Thessaly in northern Greece, almonds known for their unique flavour are harvested by hand. They are then gently toasted so that their crunchiness is preserved. From the lands of the Peloponnese, this organic extra virgin olive oil will enhance the flavour of your salads and grilled fish. It is made with young Manaki olives, cold pressed for the best extraction. 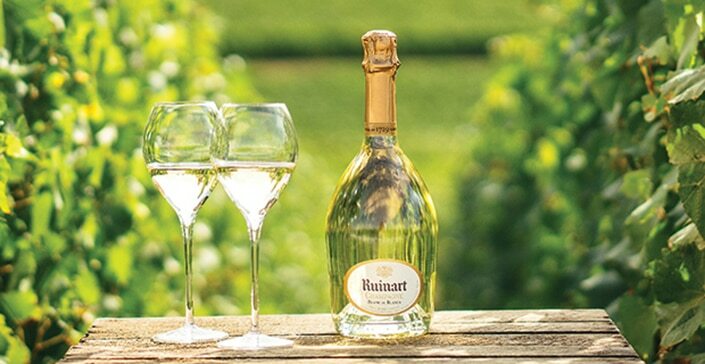 It reveals floral notes of wild, aromatic herbs. Easy to recognise due to its violet colour and rather fleshy texture, this famous olive will be perfect for your aperitifs or to enhance your culinary recipes. Produced by a family business settled for several centuries in Peloponnesus, these characterful olives are not to be missed. An exceptional honey. Coming straight from Greece, sun-kissed and Mediterranean. With its light golden colour and delicate perfume, this flavoursome nectar with notes of pine nuts and resin goes perfectly with tea, biscuits, baking or can be used to baste meat. Crunchy crackers made in Greece based on an age-old recipe from Crete. Quality flour combined with seven sublime cereals and extra-virgin olive oil. The result is simply delicious. Perfect for adding a Mediterranean touch to your aperitifs. Produced by a family business from Peloponnesus based on an age-old Crete recipe, these Gressins will go perfectly with your tapenades and mezzes. Oak honey is produced in the mountains of central Peloponnese. A dark, quality honey coming from the idyllic lands between seaside and mountain. Aromas marked by wood and candied chestnut, which goes perfectly with milk, tea, fruit and meat. A delicious cracker recipe from Crete. Dating back several millennia, it is prepared with noble, quality products. Ideal for adding some crunch to your get-togethers. Large and delicious pitted green olives from all over Greece. They are the fruit of a family business, whose adventure started more than 300 years ago in the mountains of Peloponnesus. One of the secrets of Greek cuisine. This is quite simply a sesame paste toasted in the old-fashioned way over a wood fire, and then stone milled. It is delicious on a slice of fresh bread with honey or as a seasoning.